Sleep patterns vary from one individual to another as each one of us has a different sleeping style preference. Different kinds of firm pillows offer a comfortable feel while helping one stay neutrally aligned – avoiding discomfort and helping one get better rest. One main difference between firm pillows and soft pillows is that soft pillows tend to flatten out under pressure while firm pillows do not. Most of them lose their thickness (loft) as one sleeps – compressing under the weight of one’s head and becoming a little too thin to sufficiently elevate one’s head and neck into the ideal neutral position. This results to one’s neck falling into an uncomfortable and pain-causing downward bend. Firm pillows are densely packed with different materials like feathers or cotton to provide a taut and supportive head cushioning. Read our complete guide about the best latex pillows. Down and fiberfill pillows are at the softer end of firm pillows. 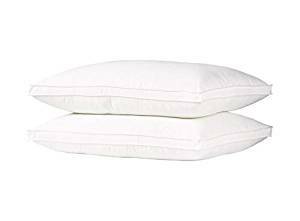 Making them more consistent in their loft and less compressible, these pillows are packed with extra filling. Down is known for its moldable and malleable qualities while fiberfill is not very malleable – which means that it is not quite good at conforming to the shape of one’s head and neck. Both of them tend to retain the heat that is absorbed from one’s body while sleeping. 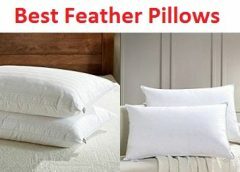 Read our latest guide about the best feather pillows. Memory foam pillows have an interesting texture which conforms to pressure, unlike any other pillow filling. It is a very unique feeling due to the material used. It has both the elastic feel of traditional poly foams and the viscous properties of water. These characteristics are what makes memory foam pillows so unique and popular. Memory foam pillows offer comfortable support for one’s head and neck. It also evenly distributes one’s body weight – eliminating pressure points. On the unfortunate side though, it tends to lose loft and becomes thinner whe n warmed – which results in a pillow that doesn’t elevate one’s head properly. Latex pillows are durable, supportive, and firm. The filling used for this type of pillow is extracted from a Hevea-Brasilienis tree – which is also known as the rubber tree. Latex pillows are not moldable though, so you will not be able to change its shape to fit one’s head and neck. No matter how one smooshes, squeezes, or pushes it, it will always bounce back into its original rectangular shape. Like down and memory foam pillows, latex pillows also tend to absorb and retain body heat. Water pillows are known to consistently keep one’s head elevated at just the correct level all night long – provided that one has taken the time to fill it properly. While it is not compressible, it will adapt its shape to one’s head perfectly when contained in a plastic bag – providing consistent support to the head all night long. They are also adjustable unlike most pillows. Having just the right loft for the pillow is up to how much water is added to it. They are not moldable though as the water will always bounce back. Microbead pillows are filled with thousands of small pieces of polystyrene. With that, they are a unique extra firm pillow option. They give resilient and firm support when pressure is applied, and does not compress or collapse. They are also malleable and moldable – conforming to the unique space between one’s head and the mattress. It provides an even and comfortable support, which effectively eliminates all pressure points. Its filling, though, loses its volume and elasticity over time. The polystyrene it is filled with flattens out with moderate use – resulting to an inadequate loft. The small pieces of microbeads do not grip each other too, because of their smooth edges – requiring frequent readjustment as the pillow loses its shape. Buckwheat pillows provide consistent support that does not collapse. They are also malleable and moldable, which means that it can perfectly conform to your head, neck, and shoulders. They stay cool at night because they are breathable and promote air flow. Because its filling is durable, a buckwheat pillow has a long life-span. The filling is also adjustable as buckwheat pillows have a zippered opening – allowing it to work well for all body types and sleeping positions. It might be too firm for some though. In addition to that, the buckwheat hulls, when shifted, make a rustling noise. The ideal pillow for back sleepers is a high loft, firm pillow with divots for the neck and head – providing spine alignment that is necessary for a comfortable sleep. A good option would be firm, contour loft pillows with divots for the head and the neck. The ideal pillow for side sleepers should provide overall firmer support, as they require extra support for the neck, shoulders, and spine. They should be ergonomically contoured towards the shape of the body and should also be larger in size to support the neck and head’s alignment with the spine, while still being comfortable enough to fall asleep on. The ideal pillow for stomach sleepers is a firm and thin pillow so that the head will not be forced up into the air at an awkward angle. Not only is it uncomfortable, but it could lead to a serious neck ache when you wake up. As discussed above, there are different kinds of pillows recommended for each sleeping position – as it is a pillow’s job to fill the space between one’s mattress and head to keep one’s body in a neutral sleeping position – which keeps all the pieces and bits of one’s back in their ideal positions while preventing unnecessary pressure on one’s muscles, discs, and nerves. It is important to stay neutrally aligned to avoid discomfort. Taking into account one’s sleeping position is the best way to determine what loft is right for him or her. Pillows with high loft are recommended for side sleepers and for use as a body pillow while those with low loft offers better comfort for back and stomach sleepers. One’s pillow filling will make a difference in how his or her pillow holds up over time, the type of comfort it adds to one’s bedding, and how it supports one’s head and neck. Some types of pillow filling are discussed above, and each one of them offers their own type of support and comfort. Pillow size will greatly affect one’s sleep quality. When it complements one’s bed size, it will provide support no matter how much one moves in his or her sleep. There are three common pillow sizes – which are called standard, queen, and king. Standard pillows measure 20” by 26”; queen pillows measure 20” by 30”; king pillows measure 20” by 36”. Pillow firmness differs from one pillow to another, but with firm pillow filling, compressibility is reduced, which ensures that one’s head does not sink down their mattress while they are asleep. The ideal pillow firmness shall conform to the shape of one’s head and neck, as it will not be comfortable unless it distributes the weight of one’s head evenly across the pillow’s surface. WENERSI specializes in down/feather bedding products. For one to customize the perfect sleeping experience, their down pillows offer various levels of fill weight. Making them a good choice for one and one’s family is the suitable loft and weight for all sleeping positions. With their ultra fresh treatment technology, their products offer antimicrobial solutions that exceed people’s expectations by enhancing their product’s cleanliness, freshness, longevity, and performance. 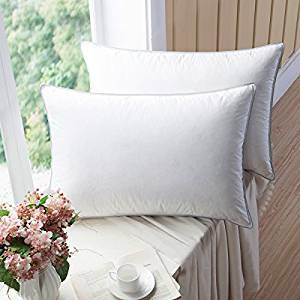 This king-sized, firm pillow offers 10 ounces more of filling compared to its soft version – which makes the pillow a denser and firmer choice while still being fairly pliable. It is made for larger bodies and wider shoulders in order to provide them with the proper support that they need. Made with down and feathers, they are durable and long-lasting and provide decent airflow. Supplying a soft surface with a great underlying support is their lofty nature. Cooling and durable, the details that go into this pillow are there with the aim to provide a long-lasting product which helps distribute and contain the fill when weight is applied. The pillow also does not crush between the weight applied and redistributes well within the casing. The pillow offers a gentle support – providing all kinds of sleeping positions with a great sleeping experience. Sova means sleep in Swedish – Simply Sova wants their customers to simply sleep as there are a lot of people who get out of bed feeling tired, achy, and sore. Simply Sova started out when they decided after years of turning and tossing through the night that enough is enough – when they finally wanted to make sleeping simply, comfortable, and easy. The Simply Sova Premium Bamboo Shredded Memory Foam Pillow was created to not make getting in a comfortable position when sleeping a challenge. It was created so that the back, neck, and the body all feel properly supported. It is made of an alternative down filling and hypoallergenic bamboo. It also has dual microfiber inner layers – both of which has the goal to give customers customized support to get a better night’s rest. It makes use of a cool polyester cover that helps eliminate dust mites, bacteria, and mold. The Simply Sova Premium Bamboo Shredded Memory Foam Pillow is firm enough to support different styles of sleeping positions. It is also designed to align with one’s spine, neck, and upper body. It has the option to be very firm which is good for providing shoulder and neck pain relief. Its firmness also allows the neck and the head to stay aligned with the spine once it has conformed to the pillow. The Simply Sova Premium Bamboo Shredded Memory Foam Pillow’s dual-layer design allows people to remove internal layers to adjust the loft easily and to allow them to customize their ideal sleeping support. The foam it is filled with is CertiPur-EU certified, which means that is really great for those who suffer from allergies. Its cover is machine washable and dryer safe, so that you can enjoy a healthy, fresh pillowcase. Exquisite Hotel Collection aims to help everyone get a good night’s sleep and help them lead the best life as they feel fully restored and motivated when they wake up. Offering people the most comfortable sleep, their US-made pillows are made to meet and exceed people’s expectations. 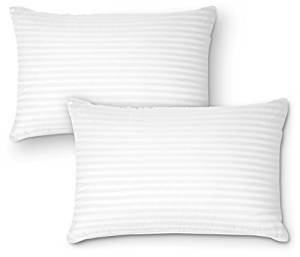 The Firm Exquisite Hotel Luxury Plush Down-Alternative Pillows are made of 100% poly microfiber. It has a superior gel fiber filling which remains cool – helping you get a quality sleep. It is the way it is because of a 220 thread count polyester microfiber cover and its optimal fiber aeration properties. Gel fiber pillows are also naturally dust-mite resistant and help prevent the accumulation of dust particles. The Firm Exquisite Hotel Luxury Plush Down-Alternative Pillows’ firmness is ideal for side or back sleepers and for anybody looking to maintain proper body alignment as it aids in fighting health conditions aggravated by a poor sleeping position like sciatica, arthritis neck and back pain, and more. The Firm Exquisite Hotel Luxury Plush Down-Alternative Pillows do not contain allergens like other synthetic or feather pillows. Its construction is no-shift meaning that it does not disturb you and compress while you sleep. It is also breathable. It measures 20 by 29 inches. They could also be machine-washed without losing their exquisite support properties and firm shape. Tempur-Pedic has been a big name in the sleep industry since its revolutionary mattress. TEMPUR material was developed by NASA in the ‘70s to support and cushion astronauts during lift off. This material distributes pressure and weight evenly. Today, they also carry a selection of pillows that makes use of the similar technology as those of the classic Tempur-Pedic mattresses. It remains to be the only mattress and pillow product that is certified by the Space Foundation and recognized by NASA. 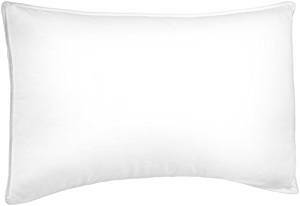 The Tempur-Pedic TEMPUR-Ergo Neck Small Size Pillow is made of TEMPUR material that is designed to allow your shoulder and neck muscles to completely relax. Its ergonomically-shaped design promotes proper alignment of your body while relieving neck and back pain. Its cover is made with 100% polyester knit and is washable and removable. It measures 20 by 11 by 3 inches. 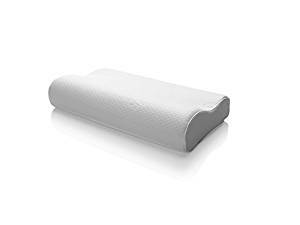 The Tempur-Pedic TEMPUR-Ergo Neck Small Size Pillow’s contoured design supports the curve created nu your shoulders, neck, and head for conforming therapeutic support. It has a firm feel for sleepers who’s looking for a more controlled sleep posture to address back and neck pain. Its dual feel design, on the other hand, has the firm TEMPUR material which aims to support the neck, and the softer TEMPUR material is there to comfort the head. Its dual sleep zone has a lower zone which cradles the head for back sleepers and the higher zone supports the head for side sleepers. The Tempur-Pedic TEMPUR-Ergo Neck Small Size Pillow is backed with a 5-year limited warranty. Its adaptive TEMPUR material offers personalized alignment and support, and also returns to its original shape after every use. WonderSleep strives to set the highest standard in the sleep industry. They constantly improve and develop the air mattress while making it portable and easy to use. 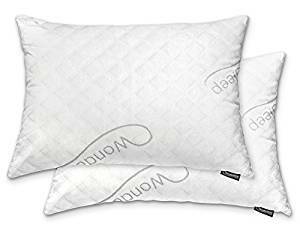 The WonderSleep Premium Adjustable Loft Pillow is made with 80% shredded memory foam and 20% polyester-fiber that is soft and molds to one’s frame while providing comfortable support. It is also wrapped in a breathable cover made up of 60% polyester and 40% Viscose Rayon (via Bamboo). Its dual-layered covers are made with micro-fiber inner layer to keep the foam inside while the soft outer layer cools. Its stay-cool bamboo material is a bamboo-derived rayon design that is breathable and stays cool throughout the night. The WonderSleep Premium Adjustable Loft Pillow is designed and manufactured to improve you sleeping posture while reducing neck and head pain. The foam filling can be removed too to decrease the firmness of the pillow to your liking. Its firmness can also be increased by adding additional foam filling or by fluffing the pillow and redistribute its filling. The WonderSleep Premium Adjustable Loft Pillow has a zippered cover which is machine washable. The pillow itself is machine washable too. Additionally, it is hypoallergenic and dust-mite resistant – providing uses with undisturbed slumber. It also is dust-mite resistant and hypoallergenic to give users undisturbed slumber. The DreamNorth Premium Gel Pillow is made of premium gel fiber. It has a breathable and soft material with poly gel fiber and an exterior layer made with 100% cotton for it to stay cool, dry, and soft. It has a luxury design (striped design) that gives a polished and clean look. Being made with premium gel fiber, the DreamNorth Premium Gel Pillow provides maximum comfort. It holds its shape and keeps your neck and head aligned with your spine – giving the most comfortable sleeping position. Having an ultra-soft texture, it maximizes comfort while you sleep. It has the perfect balance between firmness and fluffiness in order to provide users with the most comfortable sleeping experience. Ensuring maximum comfort for all sleeping positions is its filling that is made from poly gel-filled fiber. The DreamNorth Premium Gel Pillow is machine washable – enabling maintenance of the pillow’s fresh appearance and reusability. It is dirt resistant – helping you with protecting its longevity with its stain and fade resistant properties. Additionally, this pillow prevents mold, dust-mite, and mildew. It also is allergen-free (or hypo-allergenic – which means that it is great for people with asthma, allergies, and other respiratory difficulties. MALOUF believes that if happiness is put at the front of the equation, you can create an environment and culture that people enjoy, success and hard work will certainly follow. They started out realizing that the cost of wanting an upscale bedding is pricey, so they set out to find a way to experience luxurious sleep at a lower price. Their founder’s passion led them to discover how and where to create high-quality products at a reasonable cost. This discovery led them to create award-winning product pricing, quality, and packaging. 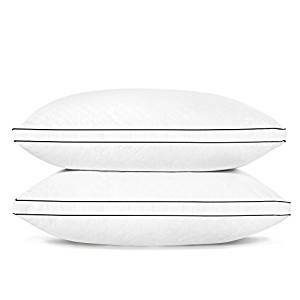 Malouf’s Z 100% Natural Talalay Latex Zoned Pillow supports the neck and cradles the head, thanks to their zoned support which features smaller pin-core holes around the perimeter and larger ones in the center. It is made through an ecofriendly manufacturing process using 100% natural and pure Talalay Latex that has no synthetic additives, and is derived from sustainable latex trees. Because of its proprietary production process, Talalay is the most consistent and resilient latex. Its zoned technology and unique foam consistency offers superior pressure relief and zoned support. 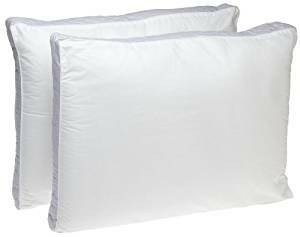 The 100% natural cotton cover delivers a clean, crisp, and breathable pillow surface. Malouf’s Z 100% Natural Talalay Latex Zoned Pillow keeps the head supported and elevated throughout the night. Its 6 to 7 inch high loft is ideal for people who prefer a thicker pillow and for side sleepers. 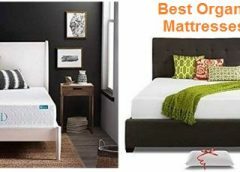 It offers loft and firm options that will feel more responsive and lighter than other memory foam counterparts. Malouf’s Z 100% Natural Talalay Latex Zoned Pillow is naturally dust-mite resistant and mildew proof. It is ventilated for comfort and ventilated breathability. It comes with a 5-year US warranty. 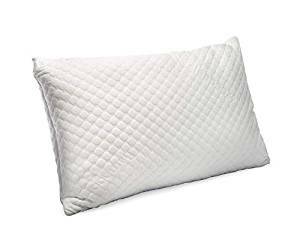 Perfect Fit’s Gusseted Quilted Pillow’s shell is made out of 233 thread-count cotton and is filled with 34 ounces of 100% Slumbersoft hypo-allergenic polyester fiberfill. To provide extra support, a gusseted custom color quilted sidewall was engineered into the pillow. This helps the pillow keep its shape under pressure. Its reinforced corded edges, on the other hand, are added to eliminate breakdown by holding everything together. The Gusseted Quilted Pillow by Perfect Fit is a firm, medium loft pillow that is ideal for side sleepers or anyone who wants a medium loft pillow. Its revolutionary interactive support system allows instant adaptation to any weigh, shape, and movement. For amazing support and comfort, it also cradles the head. Perfect Fit’s Gusseted Quilted Pillow holds 6.5 liters of recirculated air. This functions in such a way that it replaces the uncomfortable hot air with fresh cool air every time you move your head. It measures 20 by 26 inches and fits perfectly in a standard pillowcase. 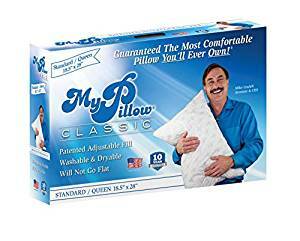 In the teenage years of MyPillow’s founder (Mike), had trouble sleeping as his pillow gets hot and he had to toss and turn during his sleep and wake up in the morning with a stiff neck and a sore arm. That is when he decided to buy a pillow with one of his entire paychecks – but still, it didn’t work. He dreamt of inventing his own pillow, and he immediately began to work on a logo and a prototype. He began selling his pillows at home shows, fairs, and expos. Today, the company has expanded and now has 15 retail locations, has over 1600 employees, has sold over 40 million pillows, and has been featured in many news articles. MyPillow Premium is made with MyPillow’s patented interlocking feel. It has a gusseted sidewall that helps with fill manipulation. It has a shredded foam filling and a cotton coating, which provides malleability and increases proper air flow – aiming to provide a cooler night’s sleep. Its cover is made of ring-spun cotton and is available in four color-coded loft levels, with Blue being the most fill, Green being the more fill, White being the regular fill, and Yellow being the least fill. 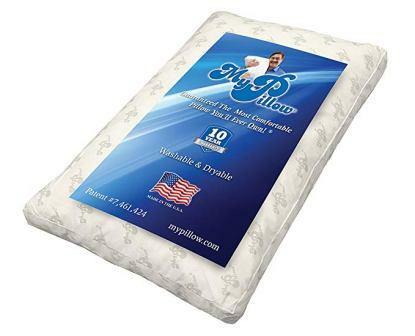 MyPillow Premium adjusts to an individual’s exact needs and does not go flat with consistent plumping and proper care. It provides underlying support and superb contouring. The pillow is available in four different firmness for people with different sleeping styles to choose from. It is supportive enough without the weight and rigidity that can be found in foam pillows. MyPillow Premium is machine washable and dryable. It is backed with a 10-year warranty and a 60-day money back guarantee. It measures 16.5 x 32 x 2 inches. With its open cell design, it gives both resilience and buoyancy while also allowing for exceptional air flow – keeping the pillow cool as you sleep and reducing room and body heat buildup while also keeping the moisture from forming mold or mildew in the core. SONGMICS was established in 2012 in Germany, and since then has been one of the largest sellers on Amazon, with millions of shoppers in a month, They believe that customer feedback is the key to continuous improvement, so they value every single comment and feedback from their customers – which in turn contributes to their fast development. They offer comfortable, durable, aesthetic, and affordable products. Through their products, they interpret two concepts which are practicality tailored for home living and ultimate space utilization through advanced design. SONGMICS Pillows for Sleeping are made of 100% polyester fiber and a silky satin, pure cotton cover. The 100% pure cotton cover features a breathable percale weave. It has a 300 thread count for a softer and smoother surface with a 900g microfiber filling that is siliconized for extreme comfort. These pillows also feature coffee edges and embroidery grids for a stylish touch. With its lightweight and soft filler with high resilience, it creates a consistent loft while providing better spine alignment and neck support. Being really soft and comfortable, it provides relief for neck pain and migraine. Its firmness is easily adjustable, thanks to its zipper. While providing firm support for the head and the neck, it also reduces the stress on one’s cervical vertebrae. SONGMICS Pillows for Sleeping are anti-mite, antibacterial, stain-resistant, and fade-resistant. They also have a zipper so you could adjust the quantity of the filling. They measure 18 x 26 inches and are machine washable. They also take just a quick fluff to bring its shape back. They are also allergen-free, meaning that the pillow is ideal for sleepers with allergies and allergen-related conditions. To further ensure customers that the pillows are safe, its material passed the TUV Rheinland test and is TUV guaranteed. The MyPillow Classic is made with the patented interlocking fill and has 3 different sizes of polyurethane shredded foam. The foam is shredded so that the pillow’s foldable and fluffable qualities are enhanced. Its cover is made of 100% pure cotton that has a soft, light, and breezy quality. The MyPillow Classic’s polyurethane shredded foam can be easily folded and manipulated – so the pillow is fairly easy to shape to your preference even if you can’t manually adjust the loft. Its filling responds quickly to pressure and you can smooth it out to make for an even distribution. The MyPillow Classic has four different levels of fill and firmness options. It also stays fairly cool when in use. It is machine washable and is lightweight. Beautyrest has been around for more than a century. They have always been at technology’s forefront as they never stopped innovating and finding ways to help people sleep better. Products by Beautyrest are designed in the US and assembled in one of their 16 plants. To make the next launch of their products even better, they research, optimize, and relentlessly test them. To make sure that their customers breathe easy, they only use foams that are CertiPUR-US certified in every product that they make. What this means is that you get a product that’s free of flame retardants, formaldehyde, heavy metals, and prohibited phthalates; this also means that their products meet low-VOC indoor air quality standards. The Beautyrest Extra Firm Pillow is soft to the touch with a 400 thread count 100% Pima cotton fabric case. It has a generous filling of plush NaturesLoft fiberfill. It has a high loft for the firm feel and comfortable sleep. The NaturesLoft fiberfill is hypoallergenic and specifically addresses the support of your neck and head in the correct spinal alignment. The Beautyrest Extra Firm Pillow has a 2-inch gusset to provide extra firm support. It is specifically designed to fit the needs of back and side sleepers – ensuring that the head, the neck, and the spine are aligned and supported throughout the night. The filling’s redistribution gives off a contouring effect that allows the neck to rest without straining one’s upper body or lower back as a result of poor spinal alignment. The Beautyrest Extra Firm Pillow is machine washable and dryable – making its freshness easy to maintain. Its 400 thread count on the casing creates a tighter weave that doesn’t allow air to pass through unlike other lower thread counts. It measures 20 by 26 inches. Pinzon is Amazon’s special brand – specializing in luxury towels and bedding, including pillows, bed sheets, blankets, and more. 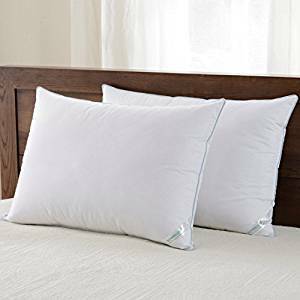 The Pinzon Shed-Resistant White Duck Down Pillow combines a 300 thread count, 100% cotton shell (for breathability) with a 65% white duck down fill. Its cotton shell is shed-resistant, helping prevent down and feathers from escaping. 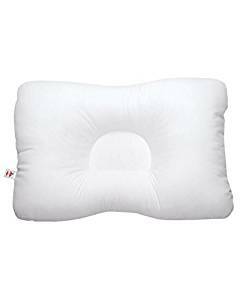 The Pinzon Shed-Resistant White Duck Down Pillow has piped edges. It has three chambers – with the top and bottom filled with 65% white duck down and the inner section filled with feather for additional volume and support. The outer sections offer a cuddly and fluffy feel. The Pinzon Shed-Resistant White Duck Down Pillow is a firm-density pillow that is ideal for side sleepers as it delivers optimum support for the neck and the head. It helps keep the neck properly aligned with the spine by excellently filling the space between the ear and the shoulder. It is also comfortable when sitting propped up in bed. The Pinzon Shed-Resistant White Duck Down Pillow’s down has been processed and sanitized in the US, making the pillow hypoallergenic. The whole sanitization process removes the dander and the oils from the down that can cause allergy attacks. It is also OEKO-TEX certified – meaning that it is made in a factory with high environmental standards. It is also machine washable so keeping it clean is easy. It measures 20 by 30 inches. 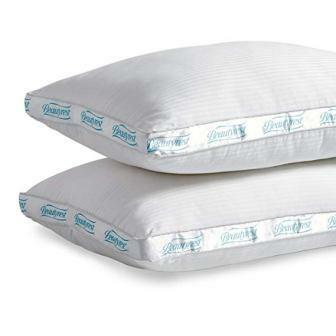 Downluxe produces great sleeping pillows that offer you the maximum comfort and best support. Their sleeping pillows have been fluffed by the top-quality fiberfill that incredibly fluffs up to give you a relaxing sleep and a comfortable feel. The Downluxe Hypoallergenic Down Alternative Bed Pillow is made of a premium down alternative fill – the siliconized 4D filling. This type of filling prevents the attachment and accumulation of dust mites and bacteria, which is why it is considered as hypoallergenic and anti-microbial. It is also mold and mildew resistant. The pillow’s casing is made of 60% cotton and 40% polyester. It is with well stitching and blue satin piping that both offer reinforced seams. The Downluxe Hypoallergenic Down Alternative Bed Pillow is suitable for all types of sleepers – side, back, and stomach sleepers. Its filling, the siliconized 4D filling, is known to hold its shape better than other fillings. It conforms to the head and helps align the neck and spine properly – decreasing the chances of having neck pain. The Downluxe Hypoallergenic Down Alternative Bed Pillow measures 20 by 26 inches. It could be cared for easily as it is machine washable (in gentle cycle with cold water and mild detergent) and could be tumble dried on low heat. Founded in 1988, Core Products combines therapy and comfort as they believe that therapeutic products should be easy to use and comfortable to wear. Core Products’ founder, Phil Mattison, worked to develop some kind of spinal support pillow when he had a sore neck as a result of an improper sleeping position. Over the years, Core Products has expanded beyond pillows and now offer products that are designed and engineered to meet and exceed the needs of people suffering from discomfort and pain. They have made it their mission to make people’s lives comfortable. Core Products’ Tri-Core Pillow has high resiliency springy fiber filling that retains its shape and backs when compressed to provide exceptional durability and support. Its cover is made of blended cotton and is both breathable and soft to the touch. It also has various configurations to accommodate different body shapes and sleep positions. Core Products’ Tri-Core Pillow has 2 neck rolls with different widths – top and bottom. This aims to provide a custom fit for sleepers with smaller and larger necks. Its side lobes are generously taller to help support the neck of side sleepers. Its center, which is trapezoid-shaped, offers orthopedic benefits for back sleepers as it cradles the head and allows the neck roll to firmly support the neck. The firm but comfortable side lobes support the head in a natural position when sleeping on the side. Core Products’ Tri-Core Pillow has an ergonomic design to keep the spine, neck, and head properly aligned throughout the night. It is shaped the way it is to cater to all sleeping positions and prevent alignment problems that come with them. It is machine washable and dryable so it could be cleaned quickly for one to get a fresh pillow whenever needed. It measures 24 by 16 inches.